Fuji sand rammers are powerful but light with a stroke range from 50mm to 127mm. Fuji sand rammers are excellent for ramming sand for casting in any ferrous or non-ferrous foundry. Non-rotary type rammers are available for use with irregular shaped butts. Low air consumption 0.14-0.18 m3/min (due to the valve mechanism) enables Fuji chipping and calking hammers to be used with a smaller compressor. The locking handle are designed to reduce the risk of accidental starting of the tools. The handle is automatically locked when the operator releases the handle. 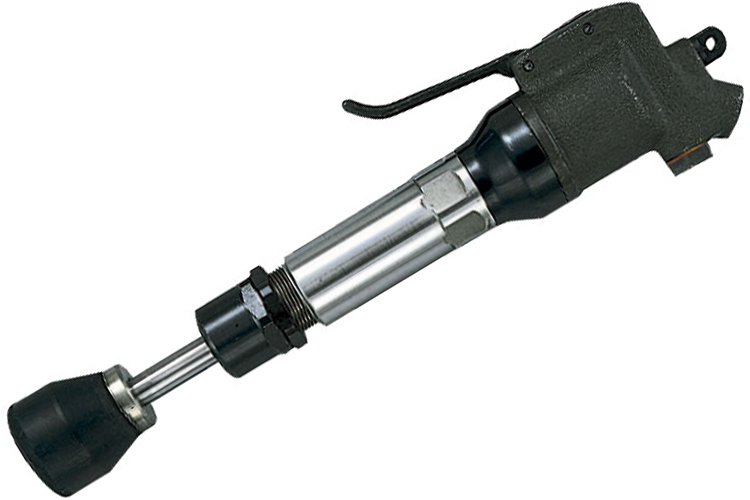 The 5412053242 Fuji Sand Rammer is one of thousands of quality tooling products available from MRO Tools. Please browse Fuji Sand Rammers for tools similar to the 5412053242 Fuji Sand Rammer. 5412053242 Fuji Sand Rammer description summary: Fuji sand rammer. Model: FR-32 Throttle Type: Lever Blows: 12Hz Piston Diameter: 32mm/1.26'' Stroke: 127mm/5'' Angle Height: 75mm/3'' Overall Length: 1086mm/42.8'' Quantity discounts may be available for the 5412053242 Fuji Sand Rammer. Please contact MRO Tools for details.